The Institute of Chinese Studies, Delhi (ICS) is one of the oldest research institutions on China and East Asia in India. With support from the Ministry of External Affairs, Government of India, it is the mandate of the ICS to develop a strategic vision for India’s dealings with China and to help adapt India’s priorities quickly and appropriately to address the research and educational demands arising from China’s emergence. 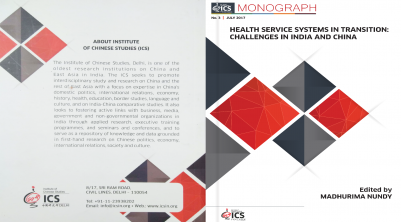 The ICS seeks to promote interdisciplinary study and research on China and the rest of East Asia with a focus on expertise in China’s domestic politics, international relations, economy, history, health, education, border studies, language and culture, and on India-China comparative studies. It also looks to fostering active links with business, media, government and non-governmental organizations in India through applied research, executive training programmes, and seminars and conferences, and to serve as a repository of knowledge and data grounded in first-hand research on Chinese politics, economy, international relations, society and culture. Promote international collaborations and exchange programme. The China Study Group took shape out of the Wednesday Seminar of scholars who had started meeting on the Sapru House (Indian Council of World Affairs) lawns in 1969, to discuss current developments in China. They were teachers and researchers from Delhi University, Jawaharlal Nehru University and the Institute of Defence Studies and Analyses (New Delhi), besides some diplomats and journalists. 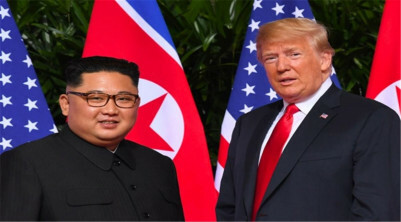 They met in different institutions and carried on the weekly discussions. The deadlock in India-China relations and issues raised by the ongoing Cultural Revolution in China, occupied much attention of the Group at that time. In 1978, the Group found a stable location at the Centre for the Study of Developing Societies (CSDS) where, besides the Wednesday Seminar, other academic activities were also organized. The task of building a China studies programme in India that produced scholars equipped with Chinese language skills and close familiarity with the history and culture of China and whose studies reflected solid knowledge of social science tools, was not easy. But that was the common goal of the China Study Group. The China Report, which had started as a bimonthly in 1964, was now located at CSDS, managed by the China Study Group. It was shortly afterwards converted into an academic quarterly journal and was entrusted to Sage-India for publication. During this period, the Group was not only active in producing research articles and books, but also in public debates in newspaper columns and the media. 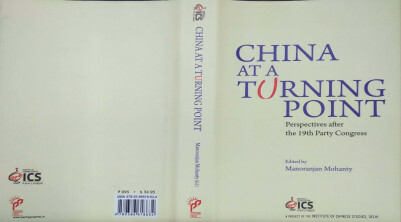 It played a notable role in reshaping Indian public opinion to facilitate the normalization and development of India-China relations, making scholarly contributions in questioning many Western stereotypes and categories for analyzing Chinese history and culture, the Chinese revolution and development experience, as well as Cold War approaches to international affairs. 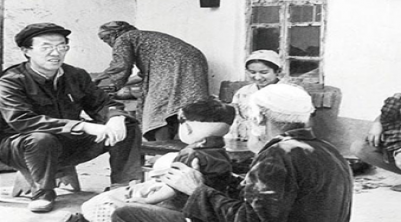 In 1990, the informal Group took a first step towards institutionalization when it constituted itself as the Institute of Chinese Studies, within the Centre for the Study of Developing Societies (CSDS), as one of its programmes. The Group was now affiliated with ICS as Honorary Fellows. The Institute started getting funding from various sources. The Indian government’s Ministry of External Affairs (MEA) came forward in 1997 with a grant to support secretarial work and seminars. 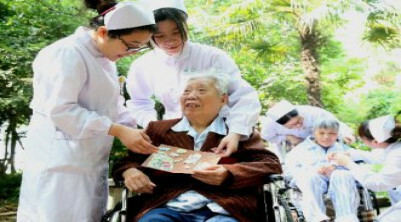 The Ford Foundation extended funding for some years mainly for field-work in China. There were also projects from other sources such as the Japan Foundation, Tata Iron and Steel Company (TISCO) and the Confederation of Indian Industry (CII). In 2000, the MEA leased space for the ICS in the CSDS, which helped in further expanding the academic programmes of the ICS. Even though ICS still functioned through its Honorary Fellows drawn from various universities and institutes of Delhi, its activities had begun to acquire fresh dimensions. India-China relations had improved considerably and collaborative relations had been established with many institutions and scholars in China, resulting in joint seminars and publications. The ICS had taken initiatives together with Chinese institutions, leading to the launching of several multilateral forums, such as the BCIM (Bangladesh-China-India-Myanmar) Regional Economic Cooperation Forum and the RIC (Russia-India-China) academic trilateral, and participated also in the Boao Forum for Asia (BFA). During this period, academic studies on China had grown in humanities and social sciences and a new generation of scholars had appeared in the field in Indian universities and research institutes. In 2000, in recognition of the ICS’ activities, Prof. Barbara Harris-White gifted the late Gordon White’s China collection to the ICS Library. The ICS Library was also fortunate to receive books and documents gifted by the family members of the late Giri Deshingkar, the late Mira Sinha-Bhattacharjea, and the late Satish Saberwal. Tan Chung, Huang I-shu, C V Ranganathan and G P Deshpande have also gifted their collections to ICS. As the nodal institute with a mandate to network with scholars of China from diverse disciplines, the ICS took the initiative to organise an annual All India Conference of China Studies, in collaboration with universities and research institutions from different parts of the country. This is a forum where scholars working on China and East Asia come together to share their research findings, take stock of developments in their field and plan joint academic initiatives. China’s economic success and its new standing in the world, the steady development in India-China relations in economic, cultural and political spheres, the role of India and China in world forums and the global attention focused on their rise, brought forth many new challenges before scholars, policymakers and the public in general. It is in this context that the ICS Honorary Fellows decided to take the next major step - to reorganize the ICS and make it an independent institution with a full-time faculty and appropriate infrastructure. In 2010, the ICS was registered as a society and with the support of the MEA, announced new academic initiatives. The Institute is unique in the Indian institutional landscape, in terms of its national outreach and coordination, its intellectual resources and its robust academic programme of research, training and publications. In August 2012, ICS moved to its own premises and started functioning with a core full-time faculty.